VietNamNet Bridge - If Vietnam doesn’t have a plan to exploit sand in an effective and reasonable way, it will have to import sand in the future, experts have said. A report from the Building Material Department under the Ministry of Construction (MOC) showed that the volume of sand exploited under licenses granted by agencies can satisfy only 60-65 percent of demand in large cities. As Vietnam tries to develop infrastructure, the demand has been increasing rapidly. Experts have warned that with the current pace of construction, sand resources will be depleted in 15 years. Analysts pointed out that Vietnam still doesn’t have a scientific sand exploitation strategy, but overexploitation and unlicensed exploitation can be seen everywhere in localities. Enterprises not only exploit sand for domestic demand, for also for export. They warned that if this continued to happen, Vietnam would lack sand to serve its infrastructure development one day and will have to import sand. The same thing is happening with coal. Vietnam, for many years, has been a big coal exporter. However, due to unreasonable exploitation, it has begun to import coal to run domestic thermal power plants. Dao Trong Tu from the Vietnam River Network said the concerns were reasonable. Sand is a valuable natural resource, and an important part of the natural ecological system. It is one of the factors that make up the river, the flow and stability of the riverbank and riverbed, and the ecosystem upstream and downstream. The sand for construction and production in localities now comes from two major sources – from sand mines in mountainous areas and from large rivers, and from the bottom of riverbeds. “The exploitation of sand from riverbeds for sale now can bring ‘super profit’. This explains why enterprises rush to exploit sand, both illegally and legally,” he said. 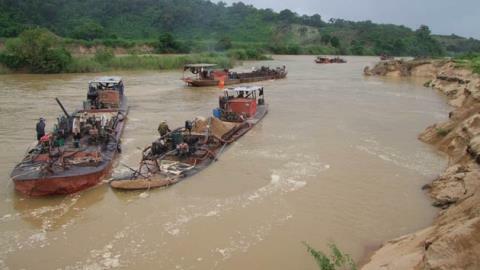 Nguoi Lao Dong quoted a captain driving a freighter from Ben Tre province as saying that one cubic meter of sand from the sand mine in Tan Chau Town of An Giang province, priced at VND40,000, can be sold for VND100,000 in Ca Mau province. Tu repeatedly has given warnings about unforeseen consequences to economic development and social stability. The reduced water level at the Red River and landslides in Mekong Delta are examples of the consequences that uncontrolled sand exploitation can bring. Recent research conducted by scientists from MARD showed that the volume of sand exploited from the Red River has been 10 million cubic meters, which has led to the lowering of the riverbed and the water level.